Welcome to our thread for discussing Senior Pairs at their GP events of the 2017/18 season! In the history of the Cup of Russia, it’s Elena Berezhnaya and Anton Sikharulidze (RUS) and Alyona Savchenko and Robin Szolkowy (GER) who had the most CoR gold medals – three of them (1998, 2000, 2001 for B/S and 2006, 2011 and 2013 for S/S). Alyona Savchenko has gone beyond that because she won one more with Bruno Massot last year. Tatiana Totmyanina and Maxim Marinin (RUS), Zhang Dang and Zhang Hao (CHN) and Ksenia Stolbova and Fedor Klimov (RUS) have won two for each team. The pairs who won one CoR gold are Mandy Woetzel and Ingo Steuer (GER), Marina Eltseva and Andrei Bushkov (RUS), Maria Petrova and Alexei Tikhonov (RUS), Shen Xue and Zhao Hongbo (CHN), Pang Qing and Tong Xian (CHN), Yuko Kavaguti and Alexander Smirnov (RUS), Tatiana Volosozhar and Maxim Trankov (RUS). There are eight pairs taking part in the competition. We will briefly introduce the competitors. A Japanese pair, two-times Japanese national champions (2016 and 2017). Currently coached by Richard Gauthier and Bruno Marcotte. Francis was born on November 8th, 1993 in Saint-Jean-sur-Richelieu, Canada. 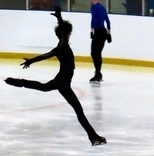 He started to skate in 2001 and previously competed with Ami Koga for Japan in 2013-2015. Sumire was born on November 11th, 1997 and started to skate in 2006. She previously partnered Konstantin Chizhikov for Japan and the pair once became the Junior Japanese national champions. Francis and Sumire teamed up in 2015. Their SP is Sakura (Spring Blossom) by Naotaro Moriyama, their FP is the Beatles Medley both choreographed by Julie Marcotte. An American pair, 2016 bronze and 2017 silver national medallists. Marissa Castelli was born on August 20th, 1990. She began skating at the age of three. Early in her career, she competed as a single skater and then paired up first with Brad Vigorito. Then in 2006, she started skating with her second partner Simon Shnapir, and they became the 2013 Four Continents bronze medallists, the 2009 World Junior bronze medallists, and a two-time U.S. national champions (2013 & 2014). The pair also won a bronze medal in the team event at the 2014 Winter Olympics. Mervin Tran was born on September 22nd, 1990. He’s a Canadian and began to skate at the age of four first as a hockey player, but then moved on to figure skating. Mervin also was a single skater first and then moved on to pairs. His first partner was Narumi Takahashi and the pair skated for Japan, eventually winning a bronze medal at the 2012 Nice World Championship (the same year as Yuzuru and Akiko won their bronze medals). When the partnership with Narumi came to an end, due to her injuries and the difficulty of Tran ever getting a Japanese citizenship, Mervin briefly teamed up with Natasha Purich in 2013. This pair competed only for a season, and in spring 2014, Marissa and Mervin started to skate together. Their personal best total score is 176.38, their personal best SP score is 67.50, and their personal best FS score is 117.74. All these results were set at the 2017 Autumn Classic International. An Austrian pair, National Champions in 2013, 2014 and 2015. The highest placement at the world championships was 18th in 2015 and 2017. Currently coached by Knut Schubert. The pair was previously by Eva Sonnleitner. Miriam was born on March 19th, 1994. As a single skater, she was twice the National Champion in 2009 and 2010. Severin was born on October 11th, 1990. His first partner was Stina Martini, and they became National Champions three times. Their personal best total score is 180.60, their best SP score is 65.09, their best FS score 115.51. All of them were set at the 2017 Nebelhorn Trophy. Kristina was born on February 25th, 1997. She previously skated with two partners, Maxim Kurdyukov and Nikita Bochkov. Alexei was born on June 6th, 1988, and previously skated with Anastasia Martyusheva and Sabina Imaikina. With Anastasia he became the 2009 World Junior silver medallist, 2009 Russian Junior champion, and 2012 Russian national bronze medallist. Kristina and Alexei started to skate together in 2014. Their personal best total score is 191.12, their best SP score is 67.18, both set at the 2017 Ondrej Nepela Trophy, their best FS score 127.66 at the 2014 Golden Spin of Zagreb. Valentina was born on May 23rd, 1986, a daughter of the Olympian marathon runner Marco Marchei. She took up speed skating and gymnastics as a child. She went into figure skating in 1993 and was first a singles skater, ending up National Champion five times. She represented Italy in the Sochi Olympics 2014. Ondrej Hotarek is a Czech-Italian skater and was born on January 25th, 1984. He had three partners before Valentina, and with one of them, Stefania Berton, he became the 2013 European bronze medallist, the 2013 Skate Canada champion and a three-time National Champion, and they became the first Italian pair to win European and Grand Prix medals. Hotarek is married to the ice dancer Anna Cappellini, the 2014 World Champion. Valentina and Ondrej teamed up in 2014 and became National Champions in 2015. Their personal best total score is 203.93 their best SP score is 71.04, their best FS score is 132.88 all of them achieved at the 2017 World Championship. A Canadian pair, the 2016 Skate America champions, 2015 World Junior silver medallists, and 2014 JGP Final champions. Currently coached by Josee Picard, Valerie Saurette and Marc-Andre Craig. Previously, the pair was coached by Patrice Archetto. Julianne Seguin was born on November 7th, 1996. As a single skater, she was assigned to the 2013 Four Continents Championships and finished 11th in her senior international debut. She also teamed up with Andrew Evans in around 2011. In November 2012, Julianne and Charlie started to skate together. Charlie Bilodeau was born on August 6th, 1993, he first teamed up with Krystel Desjardins by 2008. Their FP is Where's My Love performed by SYML choreographed by Patrice Lauzon and David Wilson???? A Russian pair, the 2014 Olympic silver medallists, the 2014 Olympic champions in the team event, the 2014 World silver medallists, a three-time European medallists (2012 bronze, 2014, 2015 silver), the 2015–16 Grand Prix Final champions, the 2013 Winter Universiade champions, a two-time World Junior medallists (2010 bronze, 2011 silver), and a three-time Russian national champions (2014, 2015, 2017). Fedor Klimov was born on September 7th, 1990, and started to skate at the age of four. Fedor tried to skate with two partners, Natalya Golubeva and Maria Chashina, before he teamed up with Ksenia. Ksenia was born on February 7th, 1992, and started to skate at the age of 6. She first skated with Artur Minchuk before she started out with Fedor. The pair’s career has been quite successful, but they have also have been dogged with some injuries, too: Fedor broke his leg in 2013 and had arm and shoulder injury in 2016, while Ksenia’s injury and boot problem made them withdraw from their GP events last year. Their personal best total score is 229.44 set at the 2015 GP Final in Barcelona, their best SP score is 76.15 achieved at the 2014 World Championship in Sapporo, their best FS score is 154.60 set at the 2015 GPF. A Russian pair, the 2017 World bronze medallists, the 2017 European and 2016 Grand Prix Champions, three-time Russian National medallists. 2014 Junior World Championship silver medallists. Evgenia was born on December 17th, 1994 and first was a singles skater. She switched over to the pairs in 2010 and her first partner was Egor Chudin. Vladimir was born on November 1st, 1992 and went through two partners, Ekaterina Krutskikh and Irina Moiseeva, before he teamed up with Evgenia. Their personal best total score is 227.58, their best SP score is 80.82, their best FS score is 146.76, all of which were achieved at the 2017 European Championship.